A house covered by a layer of grime and filth is undoubtedly an unattractive sight. Being associated with a dirty home is not something anyone would want. If you don’t want to end up being the owner of the filthy house in the block, then turn to the experts for power washing services in Uniontown, OH. The only way to go for a perfect wash is hiring a team of professionals. Wilhelm Power Washing has been providing efficient pressure washing services to Uniontown, OH residents since 1973. We commit ourselves to giving only the best to our clients. Our business owner, Randy Wilhelm, personally trains all the employees in our company, ensuring that any service you receive from us will exceed your expectations. We guarantee that you will be fully satisfied with the quality of our work by the time we are through. Wilhelm Power Washing understands the hazardous nature of pathways covered in grime. Pressure washing services in Uniontown, OH allow families to have fun outdoors without fear of accidents. With our pressure washing services for Uniontown, OH homes, you can keep your loved ones safe from dangerous slips and other injuries. The contaminants and bacteria that live in the filth covering your home pose health risks to your family. You can remove all the dirt and dust that can harm your loved ones with pressure washing services in Uniontown, OH. To ensure that you get a perfect wash, turn to Wilhelm Power Washing. We are the experts on power washing services for Uniontown, OH homes. An allergy attack outdoors can be caused by an allergen such as mildew or pollen accumulation on the deck or siding of your house. At Wilhelm Power Washing, we provide thorough pressure washing services in Uniontown, Ohio to remove any buildup covering your home. With our pressure washing services in Uniontown, Ohio, you won’t have to worry about allergy attacks caused by the abovementioned elements anymore. Though Wilhelm Power Washing sets higher prices compared with other companies, our power washing services for Uniontown, OH houses are exemplary. Our meticulous and perfect pressure washing services in Uniontown, Ohio leave homes free from buildup that could damage house exteriors. Rather than spend more on future repairs, invest in preventive maintenance today. Having a fresh and vibrant house can give you a confidence boost. Maintain your house’s excellent condition with pressure washing services in Uniontown, OH. 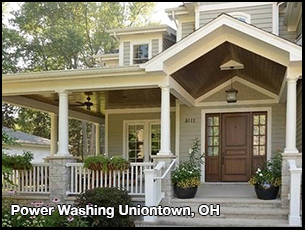 At Wilhelm Power Washing, we offer a thorough clean with our pressure washing services for Uniontown, OH houses. We make sure that you’ll look forward to coming home each day to a clean and beautiful abode. Families interested in selling their homes will gain a lot after getting power washing services in Uniontown, OH. At Wilhelm Power Washing, we can make your house more attractive to potential buyers. Increase your home’s value by investing in professional power washing services in Uniontown, Ohio today. Since 1973, Wilhelm Power Washing has been providing expert power washing and residential painting services to both residential and commercial clients in Northeast Ohio. Our dedicated staff has more than 40 years of combined experience. At Wilhelm Power Washing, we specialize in pressure washing and residential painting. When you hire us, you’ll be glad to find that our experts pay great attention to detail. We do our best to ensure that you get a quality job every time.